The lowdown: The Marvel juggernaut follows its most epic movie, Avengers: Age of Ultron, with its smallest. The single character movie formula is now set in stone and rigidly adhered to: origins backstory, quirky cast including a Hollywood heavyweight, breezy humour, easy-on-the-eye action, cameo’ing Avenger, set up for a bigger movie, post-credit tease for what’s coming next. All pleasant enough and Paul Rudd brings his affable charm to a potentially career transforming role, but this really could have done with the stuff original director Edgar Wright would have brought to the table. The full verdict: When Guardians of the Galaxy struck box office gold, Marvel’s biggest gamble since starting the whole big screen multi-character-universe thing with Iron Man paid off handsomely. So handsomely that Sony has handed them Spider-Man to look after following his last two botched outings. 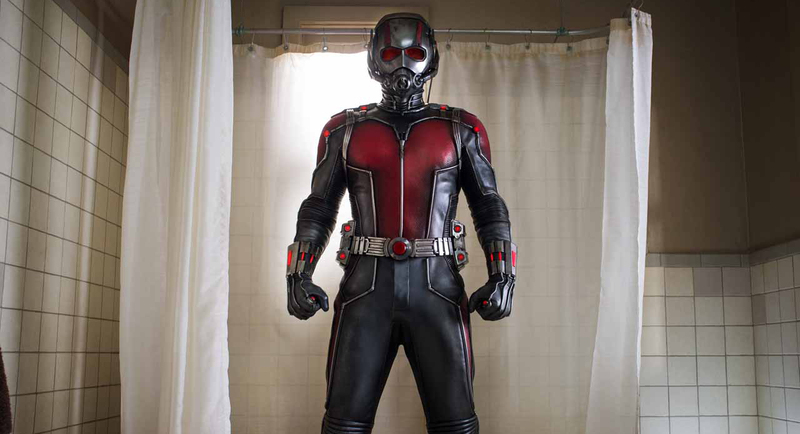 No surprise then that the studio successfully deliver Ant-Man as a summer blockbuster. Despite original director Edgar Wright’s near twelfth hour walk away, replaced by the more malleable Peyton Reed (last theatrical gig, 2008’s Yes Man, ironically the same year as Iron Man). 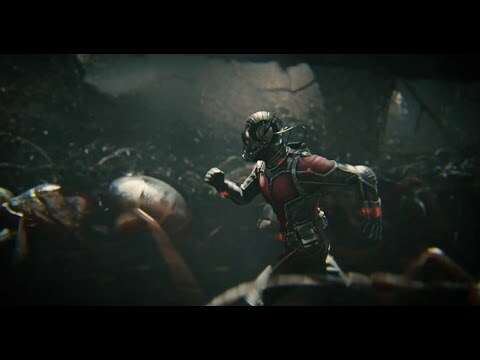 Ant-Man is a name audience may be familiar with (though they could be thinking of Spider-Man), but they will be hard pushed to tell you his backstory or any adversaries. 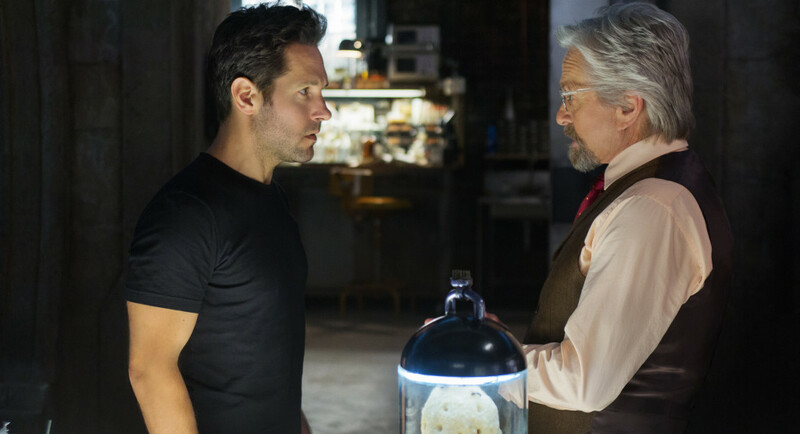 The movie actually runs with the second incarnation of the character, Scott Lang (Rudd). A Robin Hood style master thief and ex-con, Lang is the late 70s version of the character, created by David Michelinie and John Byrne. Stan Lee, Jack Kirby and Larry Lieber’s original creation, Hank Pym, is here played by Michael Douglas in full loveable, chunky cardigan wearing mentor mode (although 1980s archive film and a flashback does show Pym in action). Desperate to have the financial solvency required to reconnect with his young daughter, Lang accepts Pym’s offer to don a suit that will shrink him micro-size, so he can nick a similar rival suit designed by Pym’s protégé turned nemesis Darren Cross (Stoll). Pym knows the potential chaos the suit can bring, while Cross can’t see beyond its power. 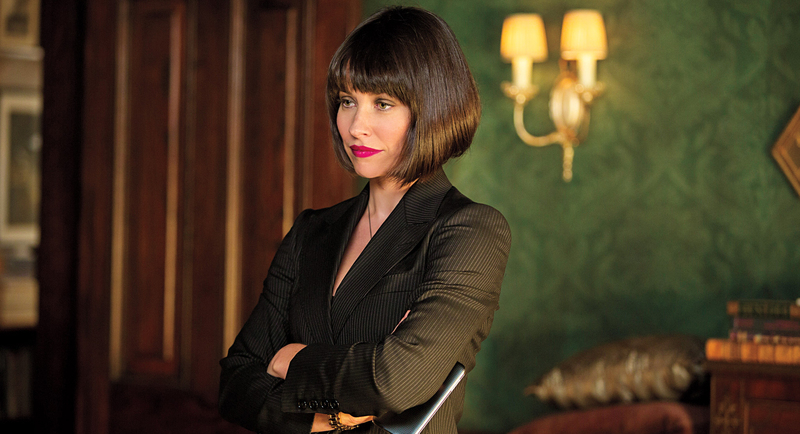 Pym is also having daddy-daughter issues of his own, with Evangeline Lilly’s Hope resenting him for banishing her to boarding school when her mother died and for his refusing to let her wear the Ant suit. Further egging the familial conflict pudding is a father-son dynamic between Pym and Cross, echoing Odin and Loki. So, a soapy melodrama, heist caper and superhero movie. Something for everyone. Yes indeed, and there are pleasures to be had. Lang’s ingenious burglarising of Pym’s unbreakable vault is a hoot of “I wonder if that would work” safecracking. 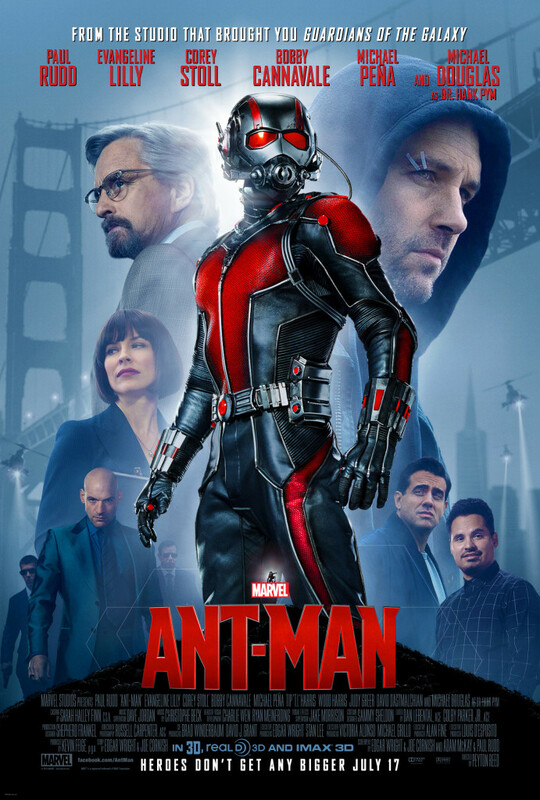 Lang’s first adventure as Ant-Man, involving a bath, a turntable, a hoover and more, evokes the thrill of The Incredible Shrinking Man and the irresistible notion that the most mundane place becomes a perilous adventure land if you’re millimeters tall. And there is a gleeful moment of “have your cake and eat it while grinning” when the superhero demand for toppling cities is met with a scale model and a shrunk-down Ant-Man. The question of why not just get the Avengers to handle the big bad is also tossed in and neatly tossed aside. All good then. But, what prevents this being great is a lack of genuine daring. The story could be lifted and shifted to any other superhero with barely a rewrite. 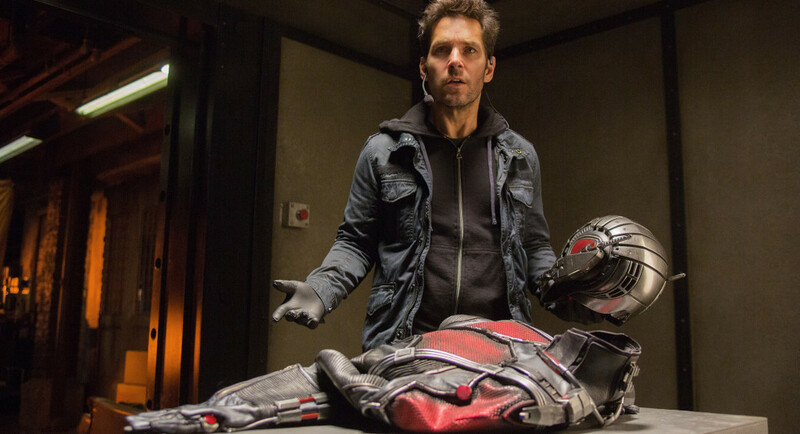 Edgar Wright and Joe Cornish receive co-script and sole story credit, but what could have made Ant-Man truly special left when Wright exited the project. The emotional content falls flat due to a lack of any real heart. Lang’s ragtag gang of loveable crooks, including always good value Michael Peña, fail as comic relief. Rudd is personable but oddly anonymous, and you wonder what earlier choice Joseph Gordon-Levitt would have done with the role. Plus, the familiarity of the story leaves you plenty of time for spotting the various cheats going on with the bunkum science to put Lang in / get him out of danger, while a climax that should be mind-blowingly metaphysical was done better in 2001, and Interstellar, and Akira. And Big Hero 6, a film based on another low-tier Marvel character. Fun then, with great use of Thomas the Tank Engine and a villain whose choice of test subjects for his experiments might send some tykes home tearful (heh heh). But here’s hoping the next in line Captain America: Civil War will match the 5-star heights of Captain America: The Winter Soldier, still the best film in the Marvel MCU.